First Friday is a community street festival celebrating the arts. 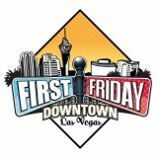 The event is held on the First Friday of every month in the 18b Arts District in downtown Las Vegas. IslandGirlz Designs can be found in the Artisan Bazaar located at the corner of California and Casino Center Drive.